Like this game a lot and always try to sneak it in whenever I have a gaming session. We have lots of fun everytime we play it though I still haven't really won many of the games. I like prehistoric theme and so I prefer this over Carcassonne that started it all. Continuing the great legacy of Carcassonne and taking it one step further. It has an excellent theme and the basic mechanics of the original game but adds a bit more strategy and less confusing scoring at the end of the game(by replacing the farmers). I highly recommend this if you liked the original, it's Wrede's best game to date. A Carcassonne variant that’s fun for all ages and is easy to learn. The game plays fast and is very enjoyable. I really like the prehistoric theme along with the added huts for scoring. I’ve found many non-gamers to like the simple tile-lying mechanics and scoring. If you’re not familiar with Carcassonne, then you need to get a copy and find out what you’re missing. This game has very nice components and is well worth its cost. A great version of Carcassone if you want a quick game. This game is better than the original without expansions. I like the original with the first two expansions the best, but if you want a quick game without all the extra tiles of expansions, this is a great version to play. 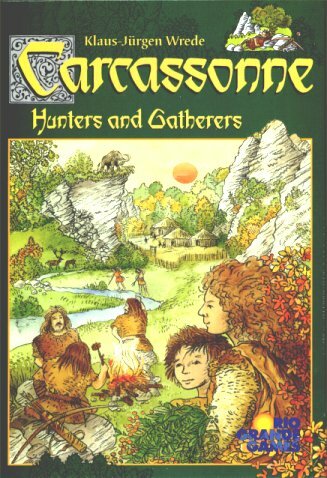 Differences between Hunters & Gatherers and classic Carcassone aren't enormous, but general consensus is this version is better balanced, being Wrede's follow-up to the original. This version eliminates one of the four scorable meeple types (no crossover of abbeys) in favor of river system "village" pieces and a set of bonus tiles with special abilities. Quick to pick up and quite fun! Hunters and Gatherers is a more cost-effective and enjoyable way to experience the build-the-game-map tile placing mechanism of the classic Carcassonne. There are more base tiles as well as bonus tiles included here, as well as more wooden bits. Adding a fourth way to score points (fishing huts) you really have, for about the same cost as basic "blue box" Carcassonne a more well-rounded game. That makes it self-contained (and incompatible with base Carc expansions), plays up to five players, and has a fun proto-historic theme. What family wouldn't prefer hunting mammoths and sabertooth tigers to the drier theme of medieval walled city building of "blue box" Carc? This is the same game basically as the original Carcassonne but with a few rule changes. However, I love the prehistoric theme that this game brings to the table. This leads to more plays for me when choosing between this and vanilla Carc. Definitely a good buy if you are just going to buy the base game (between this and Carc).